The Empire is one of Coventry’s small number of live music venues, owned and run by dedicated, passionate independents, Phil Rooney and Dave Brayley. It usually hosts fantastic touring bands like The Damned and The Skids, and some awesome tribute acts like The Antartic Monkeys, The Style Councillors, From The Jam, London Calling and The Smyths. Running a comedy gig in a music venue, couldn’t be easier. Big stage, amazing sound system, great lighting, huge bars (two of them) with fast-pour pumps, projection, and a huge cine-screen. So you’ll be able to watch the comedy show in a room that’s more than just designed-for-purpose. Send us your pictures and messages so that we can project them on our screen before the show and during the intervals. (See the feature panel on this site for more details on this). 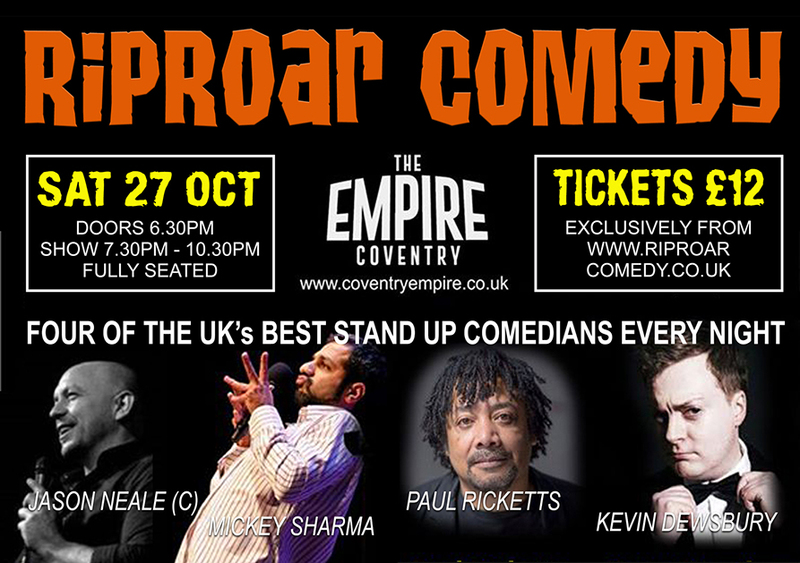 Otherwise, just sit back, and laugh your socks off with Riproar’s fantastic rosta of comedians. We’ll seat you on arrival, so that you get to sit with your mates as a group, and if you get to the venue early, there’s talk of a happy hour! More details to follow right here.